10" Reman Clutch Disc For Allis Chalmers WD45. 10" Reman PTO Clutch Disc For Allis Chalmers: 160, 6040. 10" Reman Transmission Clutch Disc For Allis Chalmers: 160, 6040. 11" Reman 4 Pad Clutch Kit For Allis Chalmers: D17 Series IV, 170, 175. 11" Reman Clutch Disc For Allis Chalmers: D17, D19, 170, 175. 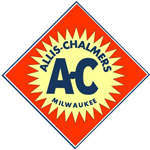 11" Reman Pressure Plate For Allis Chalmer: D19, 170, 175. 12" Reman Clutch Kit For Allis Chalmers: 180, 185, 190. 12" Reman Heavy Duty Clutch Kit For Allis Chalmers: 180, 185, 190. 1st Pinion Shaft Gear For Allis Chalmers: D10, D12, D14, D15. Clutch Inspection Cover Plate With Spring Steele Clips For Allis Chalmers: D14, D15. Clutch Pedal Return Spring For Allis Chalmers: B, C, CA, IB. Clutch Release Bearing For Allis Chalmers: 160, 6040. Control Lever Knob For Allis Chalmers: D10, D12, D14, D15, D17, D19. Curved Gear Shift Lever For Allis Chalmers: WD, WD45. Final Drive Clutch Knob For Allis Chalmers: CA. Flywheel Ring Gear For Allis Chalmers: D10, D12, D14, D15 Gas, I60. Gear Shift Boot For Allis Chalmers: B, C, CA, D10, D12, D14, D15, ED40, I40, I400, I60, IB, RC, WC, WD, WD45, WF.